Ian Whittlesea’s installation and Richard Bevan’s film will only inhabit the garden and living room of Furnished Space for a day, yet their works seem to dwell here, as if their presence is a conversation with the space around them. 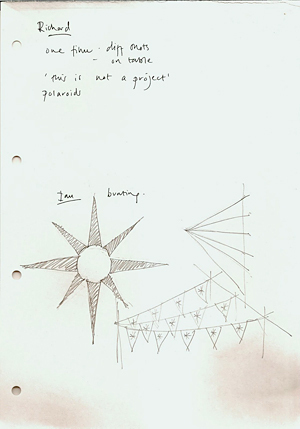 A drawing filled with light, a film projected in the room of its making and celebratory strings of bunting; each piece is in turn quiet, playful, disruptive. Richard Bevan’s film explores each nook of the flat’s interior, transforming its blank walls so that they appear fleetingly furnished with colour and pattern. Surfaces are interpreted, details caressed until hardly recognisable. The room’s customary shapes are opened out: the space where a cupboard meets a wall is mysteriously blurred and even the radiator bulks sculpturally in close-up attention. A texture is placed against a wall, quivering there for a moment like an afternoon shadow. 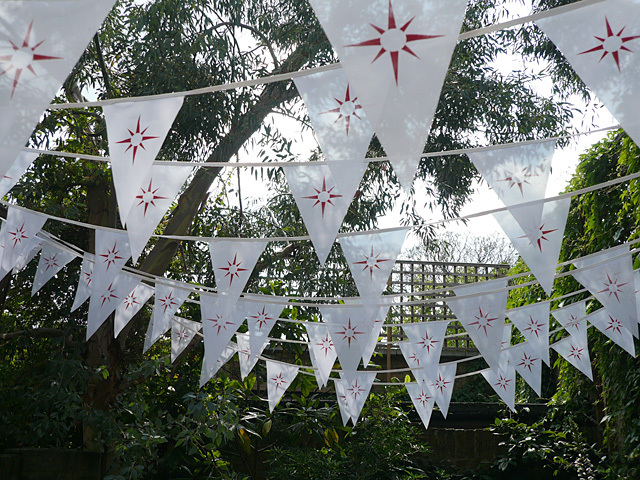 Outside, Ian Whittlesea criss-crosses the garden with strings of bunting bearing the star/sun motif of Yves Klein’s Judo Académie de Paris. These red suns floating in mid-air mark a point of balance reminiscent of Klein’s leap into the void. Meanwhile, placed against the solid stone wall of the house is a drawing of Henry David Thoreau’s cabin in the woods, a remade version of the frontispiece to Walden, Thoreau’s great book of 1854. 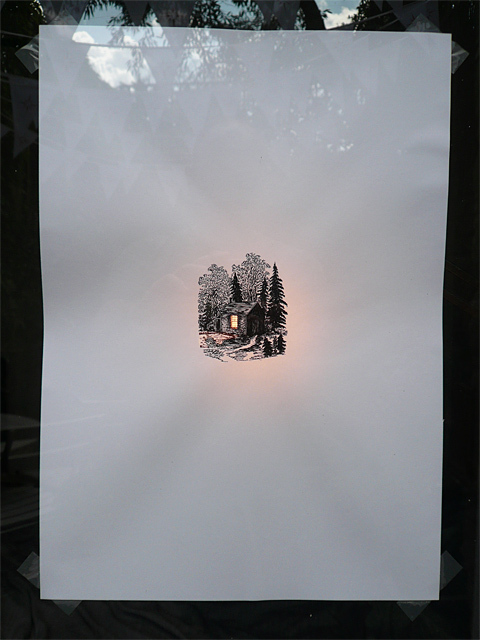 In Whittlesea's replicated drawing, a light shines within the cabin, encouraging a contemplation of that other remote interior, a space lit by Thoreau’s lamp, burning at the end of the day’s labours yet equally aglow with ideas and words. 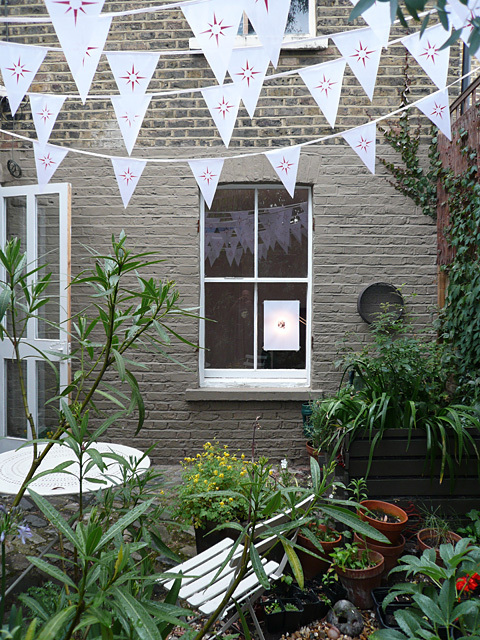 In this restrained courtyard garden, these works have an elusive companionship but a meeting is suggested in a shared title: The sun is but a morning star, the last line of the Walden text. Like the morning star’s magical poise between day and night, two cultural projects almost a century apart are, for a moment, faintly united. 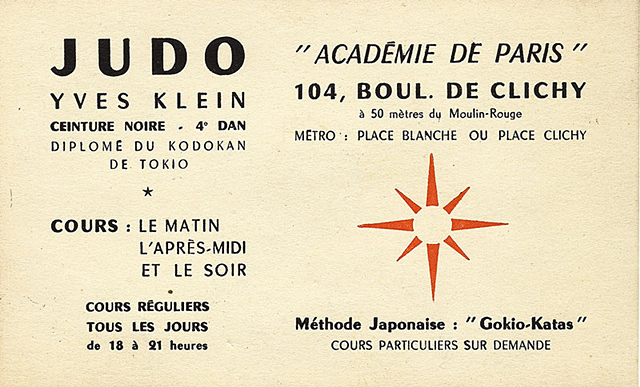 This poetic image also encompasses Klein’s fiery symbol, a fusion of sun and starburst. 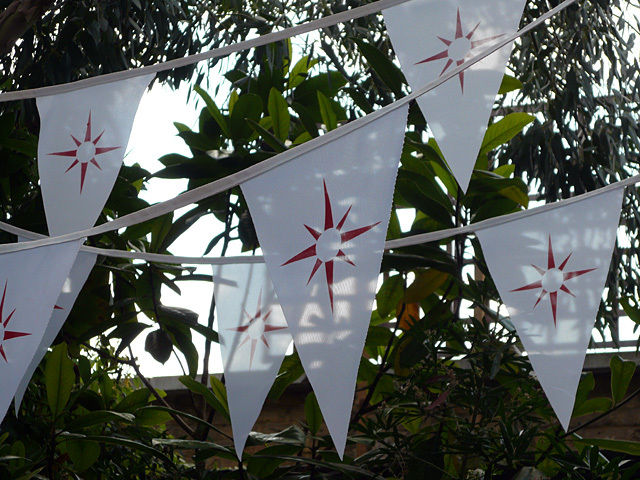 Like Thoreau’s watchful metaphor of star fading into sun, the one- day span of this show is an ephemeral thing, even a cause for festivity as the little garden decorated with bunting suggests. Each intervention here is subtle, a one-off experiment perhaps or opportunity to investigate a tangent, yet the works are also enough to sharply refresh perspective. The local and remote interact and what is familiar can be afforded a new lustre. The dancing bunting or the shiver and subtle shift of the film’s focus offer fluid perceptions amongst the constant shine of a drawing filled with light. Richard Bevan’s film rests on the most familiar objects in a living space to refurbish its overlooked details with a new, colourful emphasis. Even the decision to shoot the film in the room’s changing natural light shows a careful understanding of the situation. 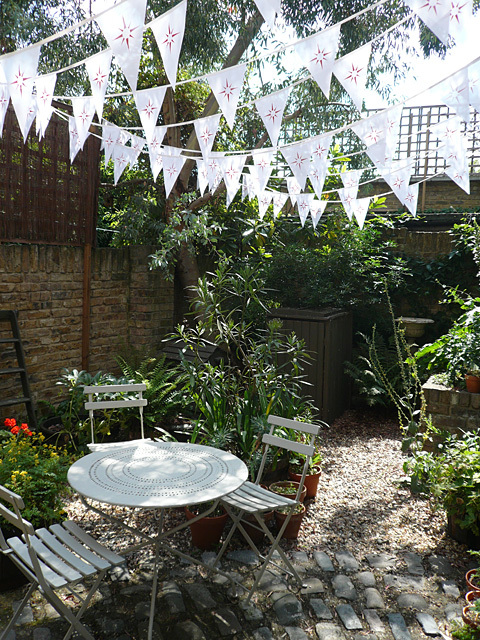 For Ian Whittlesea, the garden space is a springboard to exploring various imaginative possibilities yet his additions of colour and light also bring an attention toward the textures already present. The relation here between interior and exterior invites dialogue, which like these two installations, seem to mingle for a moment before opening up their own terrain. 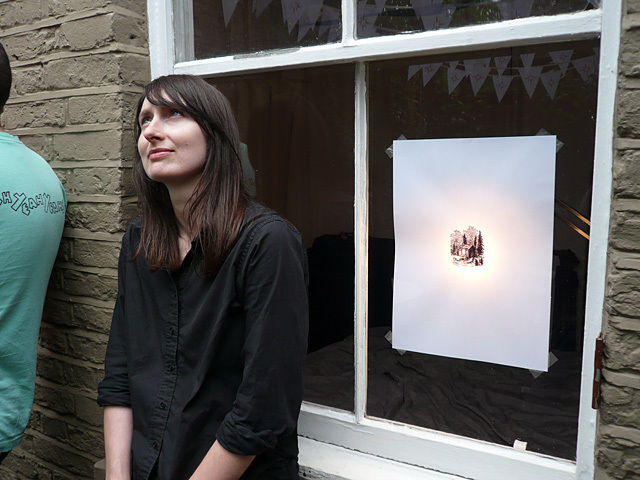 In Bevan’s film, a pattern sometimes faintly emerges as if the garden’s honeysuckle had crept in over the interior. With another ‘leap’ of imagination, the garden close at hand from the living room step might also conjure another proximity to nature that is Thoreau’s hut enfolded by forest.